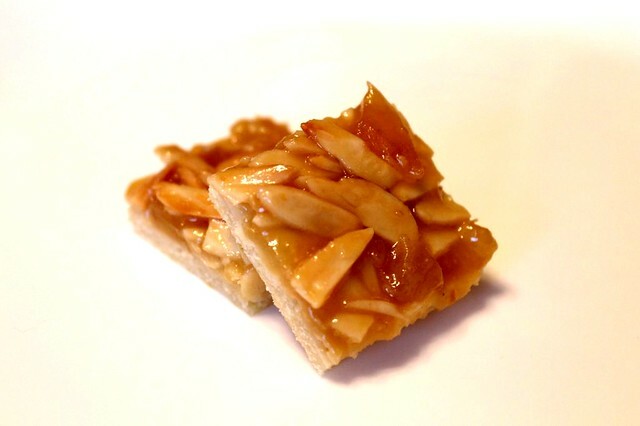 What's special about florentines are these almond flakes and candied fruit set in buttery caramel. Though the cookies originated from Italy they are mow baked in France and other European countries. Thus there are now many different ways of making them. This variation is not the most conventional, but certainly the most loved in our house. First it has a short base on which the caramelized nuts rest. Second, it doesn't use chocolate. Somehow I always preferred to avoid chocolate in florentines, though most of the recipes do call for it. It is just too strong and doesn't let me feel their fine flavor in full. However if you do like this combination, just follow the recipe and then dip each of the ready florentines into melted dark or white chocolate for half of their width. Let them set and enjoy. We had lot's of fun with this caramel. Luckily Michael was able to help me with taking pictures of it. That's how our final product looked like and mama seemed quite happy with it next morning. For the pastry combine the cold butter, flour, sugar, lemon zest and salt in a food processor. The mixture should resemble bread crumbs. Add the egg and water and quickly mix again. Take the mixture out and shape it into a ball using your hands. Do not overwork the pastry, otherwise it will come out too firm when baked. Put the pastry in a plastic bag and place it in the fridge for 30 minutes (this will make it easy to work with later). Roll the pastry on a baking paper into a rectangle 5 mm thick. Bake it for 5 minutes, take out of the oven and let cool on the baking sheet for 10 minutes. In the meantime, make the topping. In a medim size heavy base pan combine the butter, sugar, honey, cream, salt and lemon zest. Place on low heat and cook stirring gently till everything melts together. Increase the heat to medium and bring to the boil. Cook for 5-7 minutes till the caramel thickens (the texture should be like in the picture). 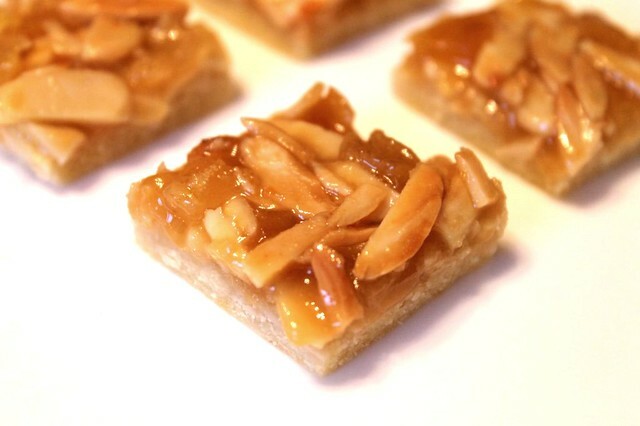 Take off the heat, quickly add the candied fruits and almond flakes and stir to get them coated in caramel. Transfer the mixture on the prebaked pastry. Using a slightly oiled knife or palette spread it into even layer and press down slightly. Bake at 180C for 10 minutes. Take out of the oven, transfer (together with the baking paper on a cooling rack and let cool for 3 minutes. Cut into squares of 3-4 cm. Let cool completely. Store airtight at room temperature. To store longer that a week, freeze them in a plastic bag. Take out of the fridge 20-30 minutes before serving.